Andrew Mitchell Hairdressing offers a range of services for both men and women and of all ages. Style cuts, styling, blow drying, permanent colour and conditioning are a few of the services on offer. Our team are friendly, reliable and experienced, they're on hand to help you achieve the look you are after and have you looking and feeling your absolute best! Please see our website for more information on services and pricing. Specialising in all forms of cutting/re-styling, Lakme colouring, Wasp & Showpony hair extensions, Caviar styling, Brazilian smoothing treatments, Aussie Bombshell - The Best & Most Natural Spray Tan Ever!! and MAC make-up artistry for all occasions. 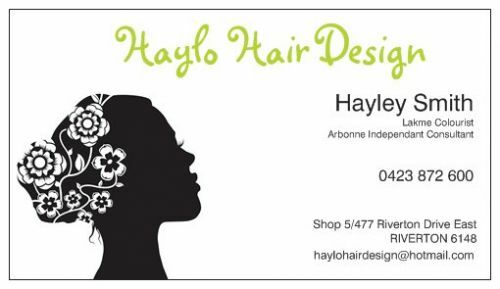 Hayley is passionate about creating a look for her clients that will improve self-confidence and make them feel fantastic. ** SPECIAL OFFER ** Why not revamp your look with a personalised make over?! Full colour, feature foils, re-style and Professional Blowout! Only $145* Usually $185* Also when you rebook you get 10% off your next visit. If you bring a friend to the next visit you both receive 10% off and a FREE GIFT!! *A small surcharge for extra long or extra thick hair.